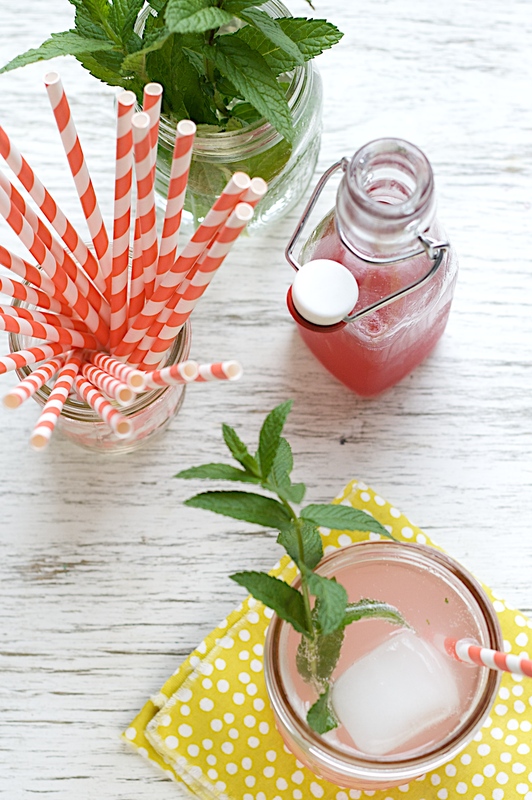 It’s about time for some summer drinks up in here, don’t you think? I don’t know about where you live, but here in Denver, it’s hot! Most of my days lately have been spent in the garden. This year’s garden has epic potential. So far I’ve planted 20 tomatoes, mostly heirlooms, in every color of the rainbow. We’ll have winter squash growing up a trellis, pickling cucumbers, peas growing up a tepee I fashioned out of bamboo poles and twine, and many other vegetables. I’m always looking for different ways to preserve and showcase what’s in season. I’ve had my eye on this rhubarb soda since I found it in Organic Gardening. I used deep red rhubarb, and the syrup turned out to be a beautiful fuschia color, the perfect balance of sweet and tart. Worry not if you don’t have a rhubarb plant (I don’t either). Well-established rhubarb plants are gigantic, and if you ask around, someone’s bound to be giving some away! This is just the first infusion of the summer (well, besides the chive blossom vinegar I’ve got steeping in the cabinet). I’ve got grand plans of berry vinegars, such as this strawberry-infused vinegar by Jayme at Holly and Flora. I think it would go perfectly with this rhubarb simple syrup to make a strawberry-rhubarb soda! Are you having visions of epic gardening or canning for the summer? Do share! Adapted from Organic Gardening Magazine New to rhubarb? Discard the leaves--they're poisonous! What is coincidental jam, you ask? Well, it's when you set out to make a rhubarb syrup, and just so happen to accidentally make a delightful jam! Enjoy! Stir the rhubarb and sugar together in a medium saucepan. Allow to sit for about 45 minutes to macerate, stirring a couple times--the juices will release and much of the sugar will dissolve. Add the water, and bring to a boil over high heat. Reduce heat to a simmer, and cook for 15 minutes, or until the rhubarb is soft and falling apart. Remove from heat. Add the mint and allow to cool to room temperature. Pour the mixture into a fine-meshed strainer, pushing against the solids with a wooden spoon. Pour the syrup into a clean jar or bottle. 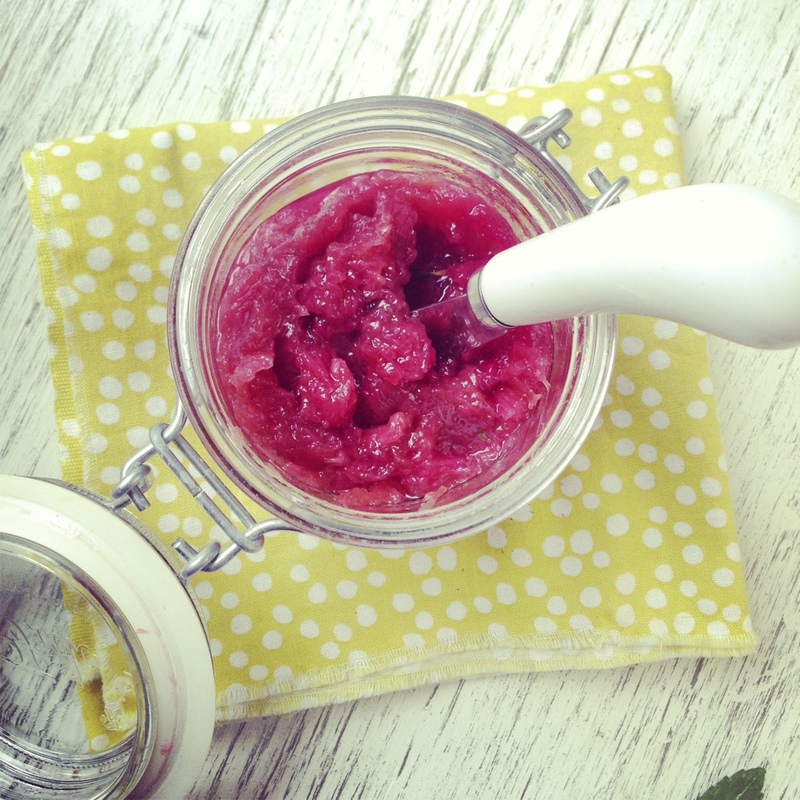 Store the jam (rhubarb solids) in a jar. The syrup and jam will keep in the refrigerator for about a week. To make the rhubarb soda, pour 2-3 TB syrup into a glass with ice (or to taste). 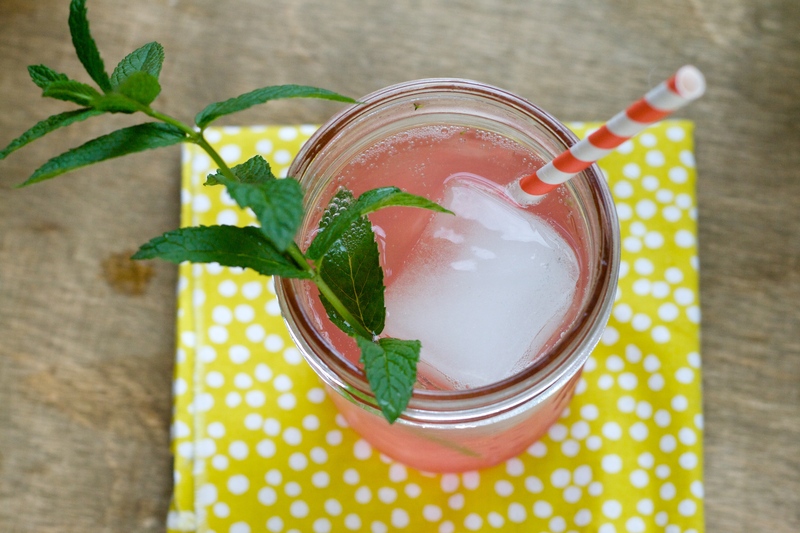 Pour in the sparkling water, stir, and garnish with a sprig of mint. Looks beautiful. Save me a glass, pretty please! We got Rhubarb growing in the yard when you need more! I need to get my hands on some rhubarb! I have just a couple of stalks in my backyard, but I would love some more, so I can make some jam. You’ll laugh at this, but I have chive blossom vinegar steeping in my cabinet, too! 🙂 Enjoy the rainy Sunday! And I am all about a rhubarb simple syrup and strawberry vinegar combo! Ha! That’s funny! Great minds think alike! Your strawberry vinegar got me excited about all the different things that can be steeped in vinegar. I hope you’re enjoying the rain too (and aren’t getting the hail we got today! ).